When it comes to jewellery I'm not a fan of large statement items, I much prefer delicate, dainty pieces and silver, white gold or platinum definitely suits me better than gold or rose gold. I love wearing jewellery but more recently I haven't worn much because I'm either at home or packing up the stuff I want to take with me to go and stay at my boyfriends. So when I received an email from jewellerybox.co.uk asking if I'd like to collaborate with them I thought it was a good opportunity to try and reignite my love of jewellery again. The packaging on the products when they arrived was very pretty, featuring brown paper wrapping, string and a teeny tiny little red peg fastening the string. I was far too eager to see what was inside to wait to get my camera out to take a picture, but you can find a picture on my Instagram here. Even though I haven't worn much jewellery for a while the pieces that I do still tend to wear when I remember are rings and earrings. The first little box I opened contained the Emerald Andralok stud earrings* (£7.50). These are sterling silver and contain a tiny little 3mm emerald coloured crystal. These are available in an impressive 17 different colours, including standard gemstone colours and some slightly more unusual ones. As well as the tiny delicate little stones the thing that attracted me to these earrings is that instead of a separate butterfly fastening the back of the earring flips down to secure the earring in your ear. This is a little tricky to do at first because the earrings are so dainty, but you soon get used to it. 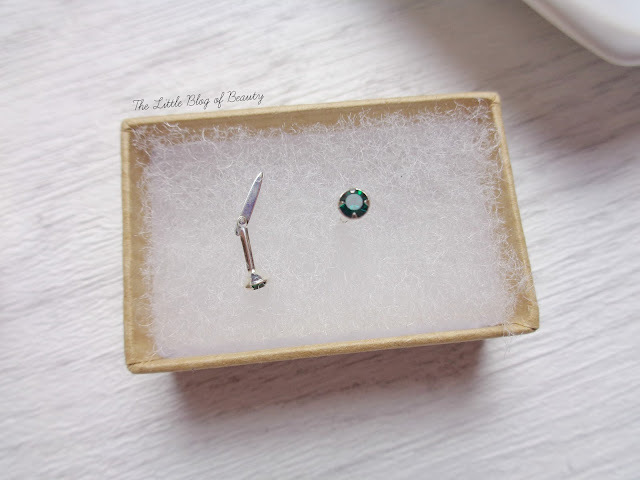 The Small Seashell stud earrings* (£6) are much larger then the emerald studs but are still small and delicate and fit on my earlobe without going over the edge. These are also sterling silver but come with the traditional butterfly fastening. The butterflies fit very securely onto the stems of the earrings so I have no concerns that they might come off if I catch them slightly. The stems are quite long and I thought they might be too long to sleep comfortably with them in but I haven't noticed them at all. I've been wearing these with the shell pointing downwards (like the shell on the necklace) because the stem is at the bottom of the shell so I can see them gradually working their way round to point downwards anyway. 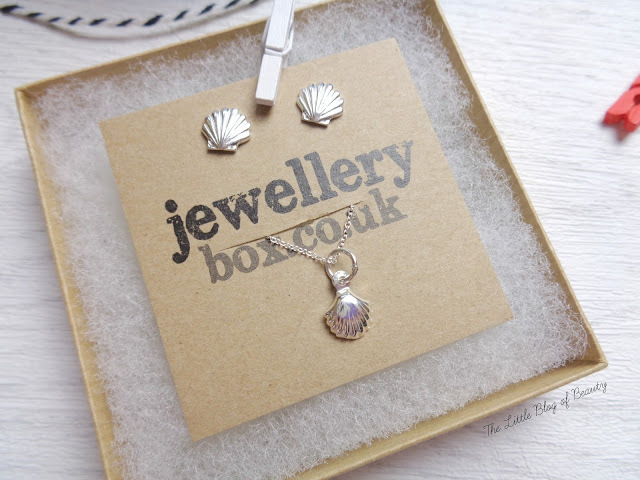 I'd spotted the seashell earrings on the website but had no idea there was a matching necklace, so I was pleasantly surprised to find the Cute Seashell pendant* (£6 - £10.20) accompanying the earrings. The chain on this one is a little longer than I would usually wear (16" - 22" lengths are available) but I'm very pleased with the delicate chain and I'm enjoying wearing a necklace again. Rings are the item of jewellery I wear most regularly. I have a white gold diamond ring that my parents bought me many years ago that I wear every day and then I have several silver rings that I wear when I remember to put them on. I do like adding new silver rings to my collection though. 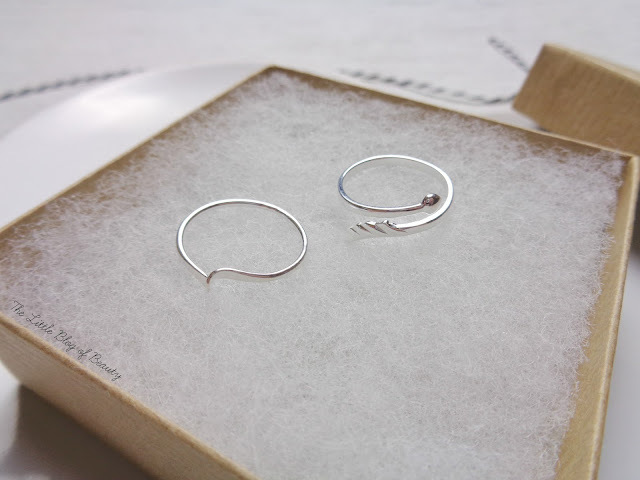 The first ring I found in my parcel was the Heart & Arrow adjustable midi ring* (£8). 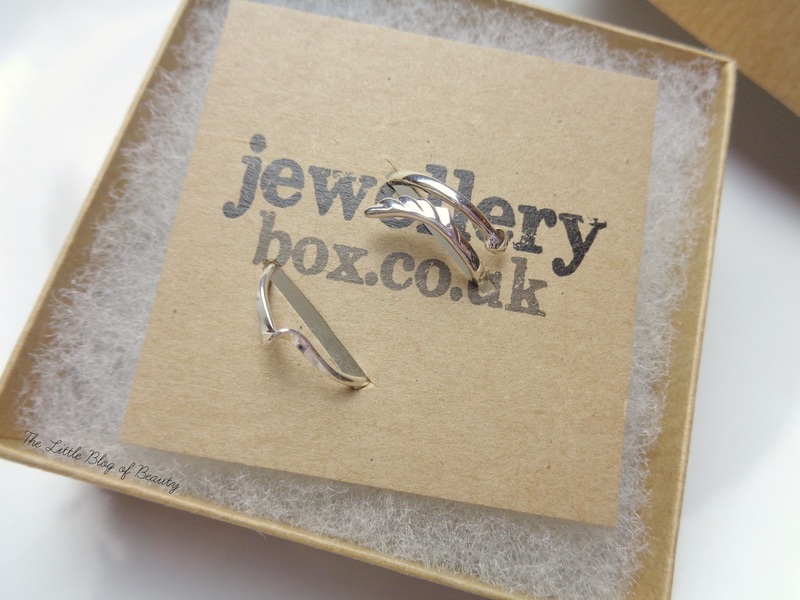 Like the other items here this is sterling silver and if you've not come across midi rings before this is designed to be worn on the top part of your finger, between the knuckle and your nail. The design of this ones mean you gently squeeze the sides together or pull them apart slightly further to re-adjust the size of the ring to the finger you want to wear it on. I do have to be careful when wearing midi rings as they can obviously come off more easily than standard rings because they are not past the knuckle, but I love how they look. Finally I found the Stacking ring with single twist* (£5). This is sterling silver and just 1mm thick, making it a very delicate ring that can easily be stacked with other rings on the same finger. In fact I found that this fits perfectly with my diamond ring as the band curves off above and below the diamond and so slots in the twist. 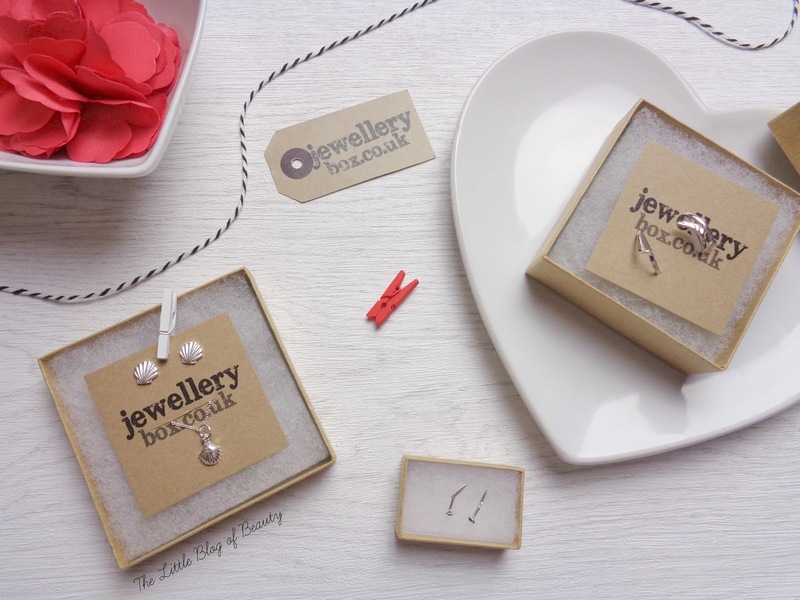 I love that Jewellerybox offer a wide range of sizes starting from a tiny size I and going up to U. My fingers are quite slim and if I buy rings from high street jewellers my size often has to be ordered because they don't keep it in stock. I believe I have this in a size L and it's still a little too big for my ring finger, but I'm used to that. I'm delighted with all of the pieces I received from jewellerybox.co.uk and I know I'll be getting a lot of wear out of each of them. Which is your favourite piece of jewellery that I've featured here? All these pieces are so cute and dainty! I love the shell earrings and necklace set perfect for the summer! These pieces are all beautiful - I love the rings! You're right, the packaging is great too, I love the simplicity of the brown boxes.